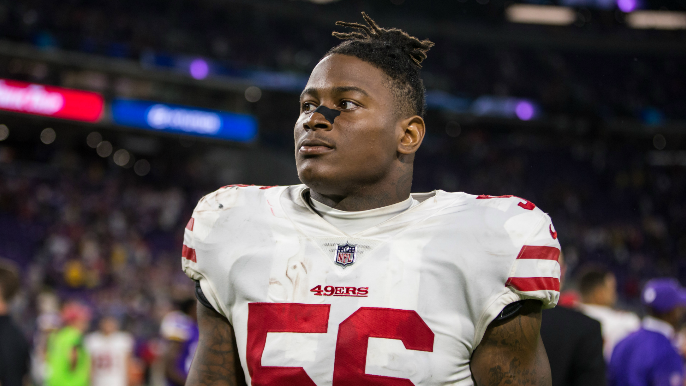 Former 49ers linebacker Reuben Foster will not be suspended for a domestic violence incident that took place at the team hotel in Tampa last season, and ultimately led to his release from the team, according to multiple reports. Foster, who is now a member of the Washington Redskins, will be fined two game checks. The league does not believe Foster’s most recent incident violated the league’s personal conduct policy. Foster’s was arrested at the 49ers’ team hotel in Tampa on Nov. 24, just hours before a game between the 49ers and Buccaneers. Foster was accused by his ex-girlfriend Elissa Ennis of “slapping her phone out of her hand, pushing her in the chest area, and slapping her with an open hand on the left side of her face,” after an initial verbal altercation. The accusations came months after Foster faced charges from the Santa Clara County District Attorney for a separate domestic violence incident also involving Ennis. Ennis eventually recanted the allegations when she took the stand, saying she made up the story to get back at Foster for breaking up with her. Ennis now claims those initial allegations were true, and that she claimed she lied in order to protect Foster’s career. Though the charges for the Tampa incident were dropped, Foster remained on the commissioner’s exempt list through last season, and was not able to play or practice with the Redskins.